Excellent for healing any damaged tissue that still has live cells (stretch marks that still have red or purple coloring). Great product to be used in conjunction with the Contour Body Wrap for clients suffering with live stretchmarks. Helps diminish psoriasis and eczema. Very beneficial for dry, damaged skin, cuts, abrasions, burns, rashes, tattoo laser removal, electrolysis, spa therapies, and radiation burns. Used by plastic surgeons around the world. Oncology departments use Repair with breast cancer patients to keep them on schedule for their radiation treatments. Results can be seen in as little as 10 days, with maximum results achieved with continual use. Tissue Repair Cream – can help heal scar tissue and stretch-marks with daily use and will be visibly decreased within 21 days of use, dry/damaged skin will be eradicated, and over 14 skin conditions can be alleviated. 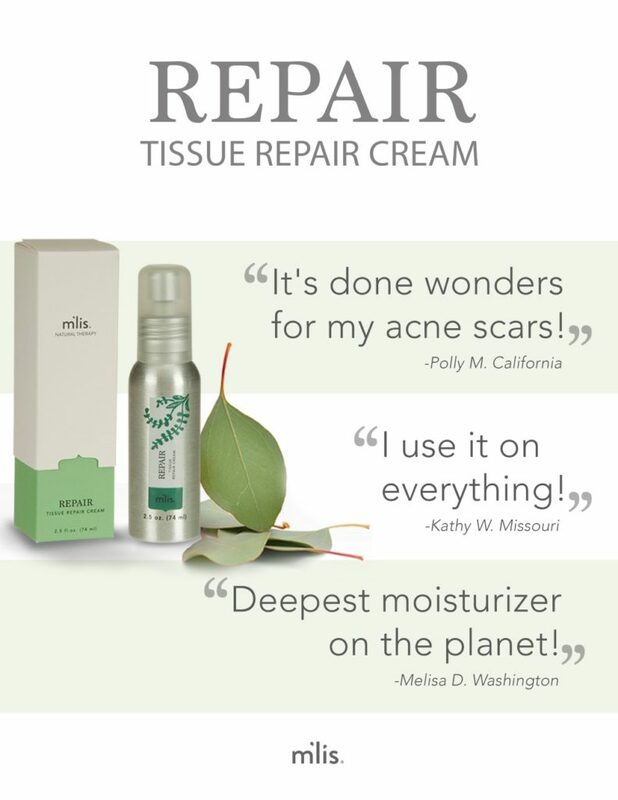 To learn more and purchase your M’lis Tissue Repair Cream, click here.